As safety leaders and professionals, we are forced to handle competition for our time and resources, as well as complete our own tasks and activities that we are responsible for. This creates significant pressures on us to juggle demands for which we have to prioritize, and there’s always a temptation to have to leave tasks and activities incomplete. There is some literature available about how poor humans are as multitaskers, and how multitasking adversely affects the quality of the completed work. This has some implications for both safety and operations, with respect to how we design and control work. 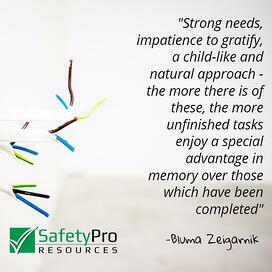 In 1927, a Soviet psychologist by the name of Bluma Zeigarnik published a study called Remembering Completed and Uncompleted Tasks. In the work, Zeigarnik studied the effect of interruption of tasks and activities, and their relative effects on memory. Without going too far down the rabbit hole, she concluded that shortly after work was completed that adults did not generally have a good recollection of events and tasks. However, when the tasks was interrupted that participants were able to recall events greater than 90% of the time. There are a few implications for operational and safety leaders with respect to Zeigarnik’s work. Human beings have an innate need for completion. Any task that’s left open occupies a part of our memory, which can adversely affect the ability to remain situationally aware of the current task or activity. When we are able to finish what we start, it gives our brain an opportunity to close the book on the task or activity, and it can move on to another with a fresh start. When we don’t give our brain that satisfaction, it ties up resources that we can use to accomplish other tasks. Add that up to a number of tasks that are started but not completed, and it can create a serious issue for a current task or activity that requires focus. Resources like mindfulness and situational awareness are absolute resources; they’re not relative. If associates are working in a fast-paced or high-hazard environment, then it’s wise on the part of the operations or safety leader to design the work for the role to be able to complete it, or have a very well defined transition or hand-off. Additionally, work that is designed to be interrupted or left incomplete theoretically has a negative impact on project or workplace safety conditions. Through the design of work, operational and safety leaders can create unintended consequences for associates at the sharp end. In safety, we also tend to fight a checklist mentality. With the historical focus on compliance, and not continuous improvement, many safety leaders and professionals have cut their teeth in programs where safety equaled a compliance checklist. Ensuring safety was the equivalent to whether or not we could check a “yes” or “no” box on a list. One more word on the Zeigarnik effect, and it has to do with the operational or safety leader’s own task orientation. Circling back the human being’s innate need for completion, and our own motivations for approaching work, it is important to realize that there’s a corollary to Zeigarnik’s work, and it has to do with our task orientation as humans. Not only do our brains love to complete activities and tasks, but it’s good for our own validation as well. No one likes to leave work feeling like they didn’t get anything accomplished. However, the need for closure of tasks or activities can be so high, that it causes us to seek out trivial items, just so we have something to cross off our list.